IHE Laboratory Domain addresses information sharing and workflow related to in vitro diagnostic testing in clinical laboratories as well as point of care testing. The IHE Laboratory Domain was established in 2003 and manages the Laboratory Profiles and the Laboratory Technical Framework. We are actively soliciting qualified experts from the healthcare profession and healthcare IT industry for ongoing maintenance, new development, and deployment of domain profiles. In thinking strategically of future work and profiles for IHE Lab and IHE AP, and in the spirit of further collaboration, the co-chairs from IHE AP, IHE Lab, and the IHE Lab/AP Secretariat, recommend a consolidation of the two working groups into one group. We think a merger is beneficial to both groups, as well as being a streamlined process that the Board of IHE International will appreciate. We already are starting to see a merged effort through the “Laboratory Device Automation” reengineering project that has software vendors involved from both domains. We anticipate the future will continue to see a blurring between the two domains and want to be positioned to best address emerging needs. The new domain could be called the “ IHE Pathology and Laboratory Medicine” domain or something similar to reflect all aspects of the laboratory. We also suggest that all co-chairs be retained to assist in leading discussions focused on one area or another and to continue on work already in progress. In anticipation of this merger, we recommend that an additional day be added to the already planned IHE Lab meeting in Paris from May 19-21. The joint IHE AP/Lab meeting then will be from Tuesday 19th 9am to Friday 22nd at noon. Please let us know what you think of this recommendation. We will be posting logistics for the May meeting in Paris soon. 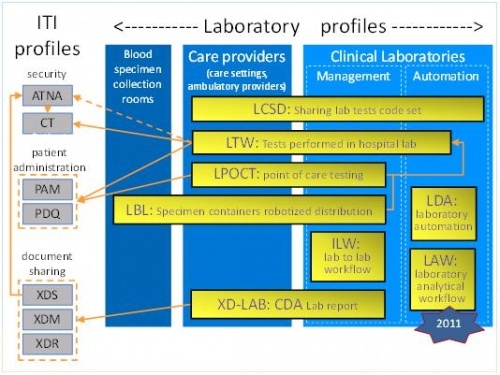 LTW - Laboratory Testing Workflow integrates ordering and performance of in-vitro diagnostic tests by a clinical laboratory inside a healthcare institution. XD-LAB - Sharing Laboratory Reports describes the content (human and machine readable) of an electronic clinical laboratory report. LDA - Laboratory Device Automation integrates an Automation Manager and robotic laboratory equipment (pre-analytical devices, analyzers, post-analytical devices) in a clinical lab. LBL - Laboratory Barcode Labeling integrates robotic specimen container labeling systems with sources of order-related labelling information. LPOCT - Laboratory Point Of Care Testing integrates performing and collecting the results of in-vitro testing at the point of care or patient’s bedside. LCSD - Laboratory Code Sets Distribution distributes managed sets of clinical laboratory codes (battery, test and observation codes). ILW - Inter Laboratory Workflow supports the workflow of orders and results with a subcontracting laboratory. LAW - Laboratory Analytical Workflow supports the workflow of analytical work order steps (AWOS) between an Analyzer Manager and an Analyze (IVD automated device). The following table outlines the activities and steps planned for the 2014-2015 year. September Publish LCC as supplement for comment? The IVD Industry Connectivity Consortium (IICC) is an organization founded by the top worldwide IVD manufacturers to catalyze worldwide modernization of standards to reduce the costs and inefficiencies associated with device interfacing. Founding members of IICC include leading IVD manufacturers (Abbott Diagnostics, Beckman Coulter, Becton Dickinson, bioMerieux, Ortho Clinical Diagnostics, Roche Diagnostics, and Siemens Healthcare) and two IT companies (Data Innovations and Systelab Technologies). Subsequent to the founding of IICC, the following companies have become full members: Orchard Software (IT). IICC believes that IHE’s LDA integration profile represents the best starting point for defining a worldwide profile, and recommends commissioning a project to extend this integration profile. The IHE Laboratory Domain approved moving forward with the IICC Profile Proposal for the next generation Laboratory Device Automation for the 2010-2011 cycle. This wiki will document this progress. Get involved in the planning committee. This is where the clinical problems are discussed and prioritized. The planning committee is an open group and is interested in having your input. Bring us your interoperability problems. You can also help by participating in the HIMSS showcase scenario definitions. In addition to getting involved in the planning committee, hold your vendors accountable. Put a statement in your RFP that indicates you want the vendor to support the actor in the profile you desire. The following are recent and upcoming public presentations and demonstrations about IHE Lab. Email our IHE Laboratory Google Group about presentations or demonstrations you know about. This page was last modified on 15 December 2015, at 15:04.